Our aim is to build understanding and access to relevant data that can support inclusion of health impacts as a public benefit of EE, while identifying where research gaps exist and/or where research can be improved and leveraged. Our goal is also to collaborate with others to explore new integrated approaches to improving indoor air quality that combines health and EE industry actions, in coordination with the U.S. DOE’s Roadmap for Integrating Health and Home Performance. 1. 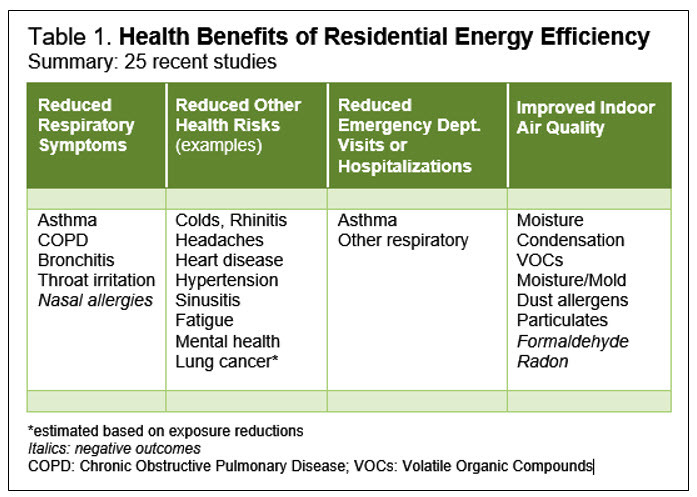 The majority of studies of residential energy efficiency document some improvements in occupant health or environmental conditions, as shown in Table 1. 2. Studies show reductions in asthma symptoms and respiratory related emergency department visits. 3. Some improvements are shown in overall physical health and reductions in rates of persistent colds, headaches, hypertension, sinusitis, heart disease and improvements in mental health outcomes. 4. Programs delivering whole house ventilation can produce significant improvements in occupant health and in indoor air quality. Improvements include reductions in asthma and respiratory triggers (moisture, mold, dust allergens, particulate matter, volatile organic compounds) and contaminants linked to cardiovascular and cancer risks. 5. Monetized benefits for observed occupant health improvements and reduced healthcare use exist at the national level, and are being considered in some state energy program cost-effectiveness decisions, with values over $1,000 per household unit per year. This research and these findings present an excellent opportunity to explore collaboration between the EE industry and the health industry to leverage resources for related research that looks at multiple EE measures. Such research can help support inclusion of health impacts in cost-effectiveness screening of low-income programs, and eventually to non-low-income programs for market rate housing.